This Tropical Smoothie Bowl is a blend of mango, tropical fruit and coconut milk – it’s cool, refreshing and packed with flavor and nutrients. Although this post is sponsored by Nature’s Touch™ Frozen Foods, all opinions are my own. I have been on quite a smoothie kick lately. I have not only fallen in love with how easy they are to make but also the many flavor combinations you can create. Anthony and I recently took a much-needed vacation. We soaked up some sun, enjoyed some R & R and ate a lot of delicious Caribbean food. I just love the laid back atmosphere of the tropics. 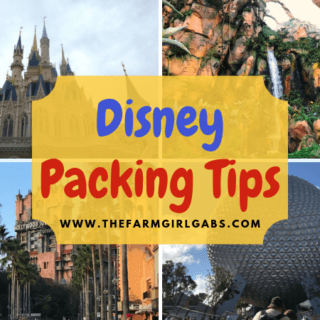 Vacationing is great; coming back to reality is not. I am sure we all feel the same way. I love tropical flavors. I just couldn’t get enough of the delicious tropical fruit while we were on vacation. One of the memorable breakfasts I had at the resort was a tropical smoothie bowl. I liked it so much I knew I just had to come home and recreate it. 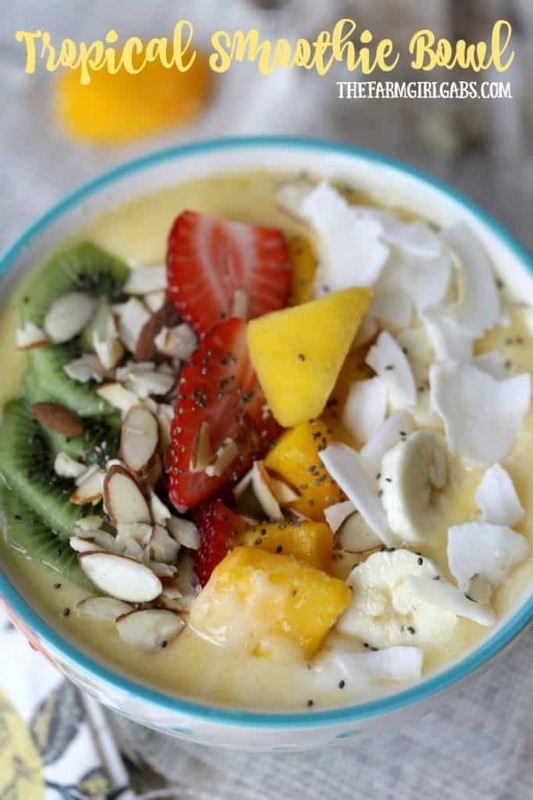 This Tropical Smoothie Bowl is a blend of mango, tropical fruit, yogurt and coconut milk . It is so refreshing and packed with loads of flavor and nutrients. Of course, the key to getting the best “Taste of Adventure” out of this smoothie bowl is to use quality ingredients like Nature’s Touch frozen fruits. My local ShopRite has a great selection of Nature’s Touch organic and pesticide-free frozen fruits and vegetables. I made sure I picked up a bag of their pesticide-free mangoes to use in this recipe as well as a bag of pesticide-free wild blueberries to use in a future recipe. Nature’s Touch Frozen fruits and vegetables are picked and packed at its peak flavor and have great nutritional value. Their pesticide-free and organic product lines are also fully controlled to ensure they meet Nature Touch’s expectations and certification requirements. I always keep frozen fruits and vegetables on hand in my freezer. 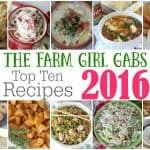 They are great for recipes like this one. This recipe couldn’t be any simpler to make. When it comes to smoothies, I like mine thick. Yep, when it comes to smoothies, the thicker the better for me. 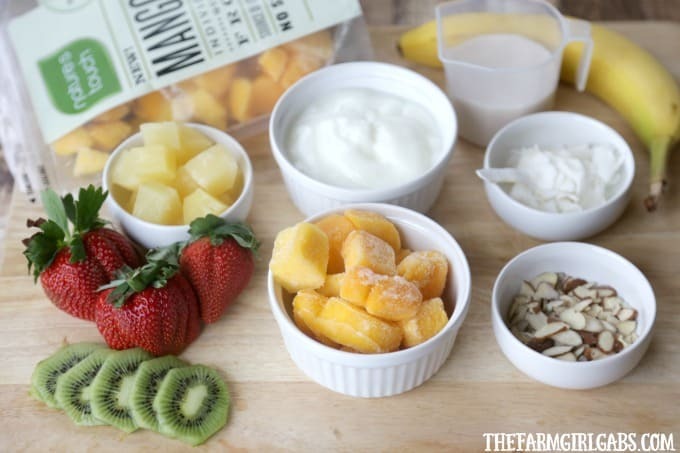 Using frozen ingredients, like frozen mangos helps to achieve a thicker consistency. After gathering all of my ingredients, I place the Nature’s Touch Pesticide-Free Mangos, banana, pineapple, yogurt and coconut milk in a blender. Blend until smooth. This will be thick. If you want your smoothie a little less thick, then add some more coconut milk and blend until you reach the desired consistency. Pour the smoothie into a bowl and garnish with some mangos, kiwi, strawberries, banana, almonds , flaked coconut and chia seeds . This Tropical Smoothie Bowl is almost too pretty to eat. Almost is the operative word. Once I took my first bite, it brought me back to the tropics. It’s a healthy and delicious breakfast. Add Nature’s Touch Mangoes, banana, pineapple, coconut milk and yogurt to a blender. Process until smooth. If smoothie is too thick, add more coconut milk. 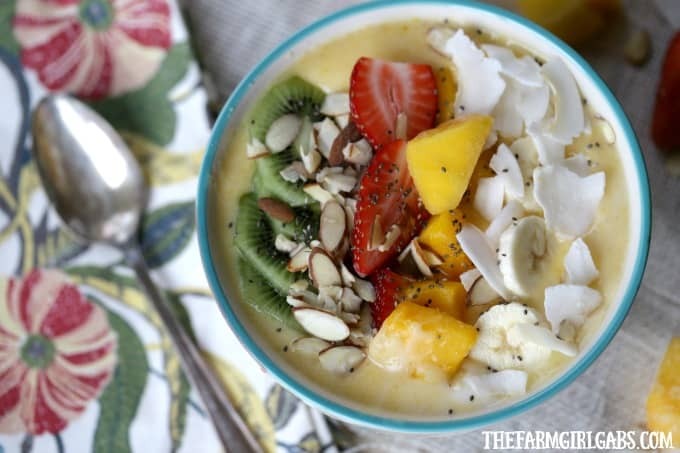 Pour into a bowl and top with mangos, strawberries, kiwi, pineapple, coconut flakes, almonds and chia seeds. Dang! My blog-friend Recipe For Perfection tweeted this link and i had to click over! This looks like a dreamy breakfast to me!